QAHN veteran Rod MacLeod was presented with a Special Recognition Awards, in honour of the Quebec Anglophone Heritage Network's 15th anniversary convention, which took place on June 5-6, 2015, at several venues in the Lower Ottawa River Valley. 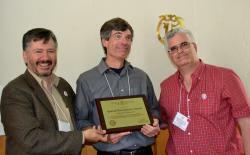 The presentation, by QAHN president Simon Jacobs and executive director Matthew Farfan, took place at QAHN's annual awards ceremony, which this year was held at St. Mungo's United Church in Cushing, Quebec. In his introduction to Rod MacLeod, Matthew Farfan called attention to MacLeod's "fifteen years of unstinting dedication to the organization." larger_img_9884.jpgThe 2015 award recipients, St. Mungo's Church, Cushing. (Photo - Matthew Farfan)He noted that MacLeod had been a leading light at QAHN ever since the organization's foundation back in 2000. Pointing out that Macleod had only missed one AGM in all that time, he mentioned some of the many hats that MacLeod has worn over the years on behalf of QAHN, including: president (for five years); chair of the Montreal Committee; editor of Quebec Heritage News magazine; member of the planning committee for the annual Arts, Culture and Heritage Working Group meeting; project employee; ambassador at countless events; and many others. "Rod's also one of the nicest people you'll ever meet," the executive director added. For his part, MacLeod expressed total surprise at the honour. "I'm totally surprised," he said. He then joked about how QAHN had not asked him to do anything within the last couple of weeks. "Kidding aside, though, I really appreciate this."